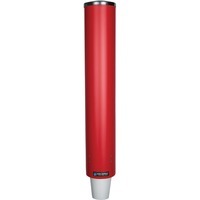 San Jamar Water Cup Dispenser SJMC4410PRD $41.69 Pull type cup dispenser provides one at a time, water cup dispensing to reduce waste and help you keep costs low. Self adjusting design accommodates a wide range of paper or plastic beverage cups sold separately. Top loading design simplifies the refilling process to keep maintenance times at a minimum. High impact, polyethylene construction holds up through daily use for long lasting performance. Cup dispenser is designed for use with 4 oz. to 10 oz. water cups.